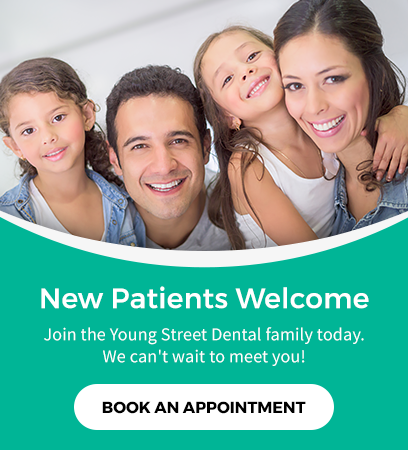 Our dental team at Young Street Dental in Chilliwack offer crowns to help patients who want to improve the shape and appearance of their teeth. Book your appointment at our Chilliwack dentist office today. A crown is a porcelain cover that goes over the tooth that can be used to restore your tooth's shape, appearance and function. The tooth is shaped like a thimble and an impression or mould is sent to the laboratory. The lab technician makes the crown to be placed over the thimble and the tooth is restored back to its normal color and function. There are many situations that can arise to necessitate having a crown or cap placed on a tooth. These include broken teeth, large fillings, root canals, cosmetic restoration and functional restoration. When a tooth has more than 50% of its structure as a filling it is more susceptible to breaking through normal chewing and biting. When it breaks or the filling deteriorates, the next step will be a crown. Over time, a tooth that has a root canal can become more brittle than a tooth without a root canal. Many teeth that have a root canal also have large fillings so a crown is often recommended to avoid dealing with the potential breakage. Crowns are often used to change the color or shape of a tooth. Many people have a smile they would like to change and crowns are often the answer to help them improve their smile. Crowns are also used to restore a worn down tooth back to its original chewing and biting capability. Like anything placed in the mouth, crowns require routine care and maintenance. Good oral hygiene on your part and regular visits with the hygienist will maximize the number of years you can expect that crown to last.